The transition of Montecito from an agricultural region to a wealthy residential community may be traced to the early 1890s. Although transplanted Easterners discovered the area as early as the late 1860s, they came largely to work farms and ranches. When Issac George Waterman settled in Montecito in 1892, he had no such intention. Waterman was born in 1871 in Philadelphia. His family had built its fortune in a number of ventures including Caribbean coffee plantations, coal mining, and railroads. Orphaned at age 14, his grandmother trundled him off to Santa Barbara for his health, to a house near today’s Granada Theater. Waterman was an accomplished musician and it was at one of his concerts that he met his future wife, Jean Alexander, whose father had also come to Santa Barbara because of flagging health. After marrying in 1892, they moved to a small house on acreage Waterman had purchased near Sycamore Canyon and Ashley roads. The couple set about expanding the home, adding a music room and a large west wing made of stone. They engaged Elizabeth Burton, a major figure in Santa Barbara’s Arts and Crafts movement to design the gardens, which emphasized a woodland effect. They christened their estate, Mira Vista, and the home became a social center as more wealthy Easterners began to flock to the region. Waterman employed a large staff; James Ross, the coachman, later became Santa Barbara chief of police and then county sheriff. Waterman was a profligate spender and by the early 1900s had a number of creditors snapping at his heels. There is some indication that these overdue bills were not due to financial problems; Waterman simply chose not to pay them. The marriage was also in trouble and after living apart for four years, the couple divorced in 1901. Spending less and less time at Mira Vista, Waterman sold the 7-bedroom home and surrounding 42 acres in 1905 for $85,000. This included large lemon orchards, which had been a source of income for the family. The estate passed through the hands of a number of owners until sold to Mr. and Mrs. William G. Henshaw in 1913. The selling price of $132,000 indicates the growing value of Montecito real estate. The Henshaws proceeded to greatly enlarge the main house, using stones quarried from Montecito Creek to replace the vestiges of the original wooden house and expand the entire structure to three stories. Little expense was spared, with interiors finished in walnut, redwood, and mahogany. The gardens were also redone and featured fountains, pools, a large artificial lake with an island and, in 1917, even a statue of Abraham Lincoln. Such was the magnificence of the Henshaw’s creation that the local Flying A studios used the grounds as a movie set. Mira Vista remained in the Henshaw family until 1945 and, in the following year, the property was sold again, this time to Westmont College, which transformed the main house into a dormitory for women students. In the early 1970s, the college began to divest itself of the property and the dormitory became a private residence again. A 1980 real estate magazine describes the property: 16 bedrooms, 14 1/2 baths, a living room 48 feet long and 21 feet wide. All of this, with grounds that included a 5-bedroom guest cottage, could be had for under $1 million. 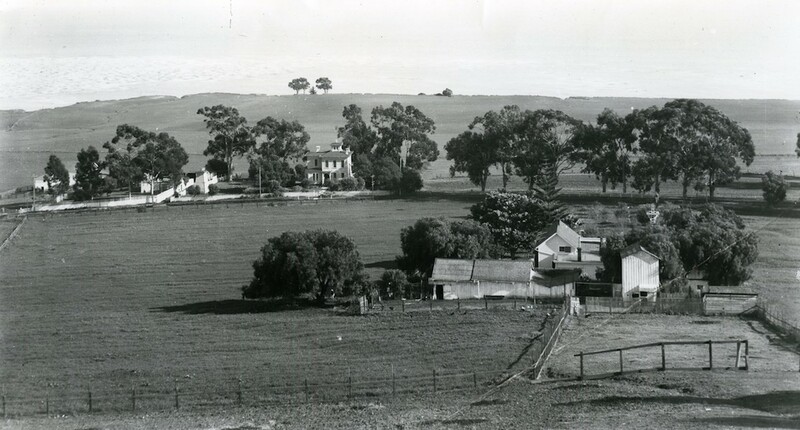 The estate house still stands today as the embodiment of that all-important transitional phase in Montecito’s past.